When travelling the world, your backpack will be your best friend. But, choose the wrong pack, and it could end up being your worst enemy. There are many things to consider when picking out a backpack. We’ve been travelling around the world for almost 7 years now, and although we’ve gone through a few different bags (and brands), we always travel with a backpack, as opposed to a suitcase. In this article, I’m going to share my tips and advice for choosing the right backpack for your travels. There are 2 main styles of packs to choose from. You can go for top-loading, or front loading. 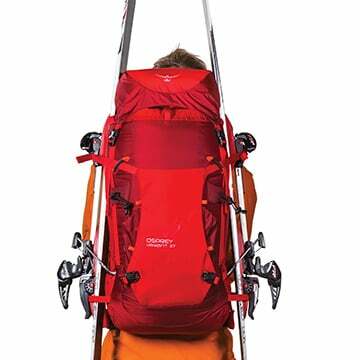 Top loading packs are typically used for hiking, backpacking or other technical trips, not regular travelling. They’re more narrow and long (which is good for keeping your items centered on your back when hiking), and they are usually quite big at 70L or so. For a world traveller, it’s difficult to pack your items into a cylinder, as nothing you pack will be that shape! Top loading packs only open at the top. This is fine when you’re on a camping or backcountry expedition, and all of the items in your bag will be used every night to set up camp. But, for regular travel, it’s annoying having to dig through your bag, or empty everything out, just to find some socks that you stashed at the very bottom! Not to mention, it’s dark inside the bag and you can’t see what you’re after. 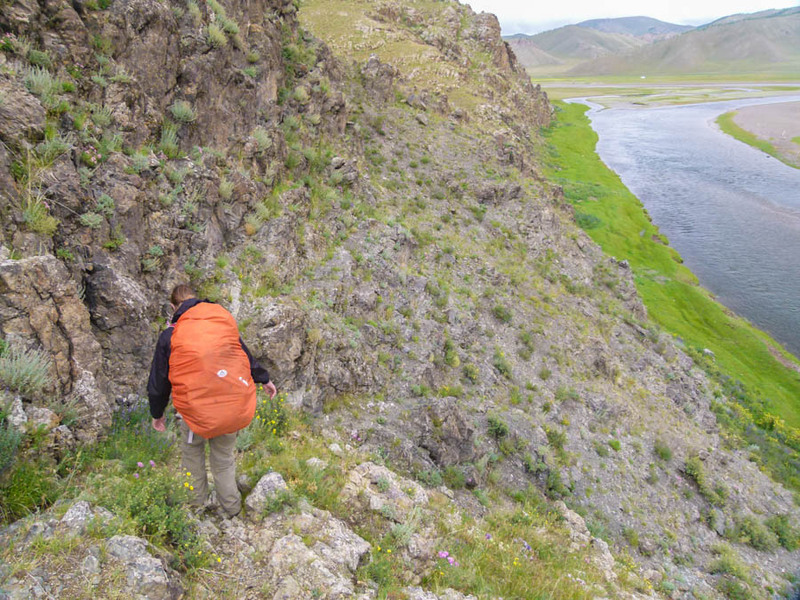 With a top loading backpack, you have to pack in layers – this can be frustrating. 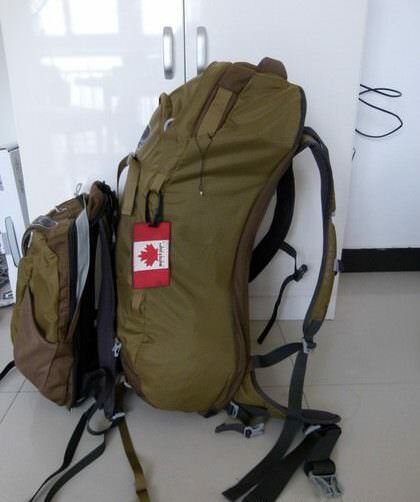 These types of packs normally have lots of straps hanging off of them – which are used to strap in a tent, ice picks, trekking poles, a sleeping pad, etc. The straps can’t be zipped away, leaving them exposed and easily damaged when put through airport security conveyor belts, or when tossed around by airport staff. Top loading backpacks aren’t very secure. These types of bags close at the top with a drawstring, and a fold-over, buckle flap. 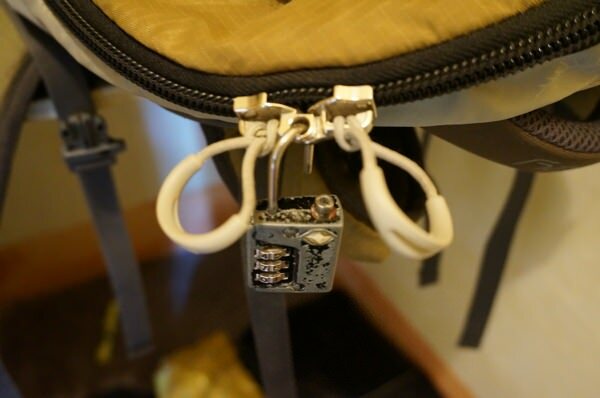 There aren’t any zippers that you can lock together, meaning your bag is a prime target for theft in hostels, on buses or when you’re just walking to your hostel. As you can see, there aren’t really too many pros to travelling with a top-loading backpack, unless you are going on a proper hiking / camping trip, in which case, there are many. With a front loading backpack, you can easily see everything! Lockable zippers are a key feature in a backpack, and unlike the top-loading packs, front loading ones have lockable zippers – get yourself some TSA approved combination locks for travel days, and to lock up your bag when you leave it in your hostel / hotel room. The weight of this type of backpack varies depending on which size, style and brand you purchase. However, in general, front loading backpacks weigh a bit more than top loading ones. It depends on the brand and type of backpack, but most front loading packs allow you to stow away the harness straps and hip belt in a back panel. Being able to zip these away during travel days is great, as they will stay fully protected and won’t get damaged. There are many pros when it comes to travelling with a front loading backpack, and apart from a bit of extra weight, there are no real cons (in my opinion). Regardless of which style of backpack you choose, you will want to make sure that it has a sturdy harness system and a good amount of padding on the shoulder straps, and the hip belt. Padded hip belt and shoulder straps. Backpacks are heavy. Take some of the strain off your shoulders by having padded straps. Similarly, make sure your hip bones get some relief as well, and ensure that there is padding on the hip belt. The weight of your pack should actually fall on your hips, not your shoulders. Make sure that your pack has an adjustable hip strap so you can tighten it up and give your shoulders some relief. Compartments. You’ll want to make sure that your pack has numerous compartments. Your clothes will go in the main part, but all of your random items will need to be put somewhere. Splitting up your belongings into various areas of your bag is a great way to stay organized – if you remember where everything goes. Outside handles. 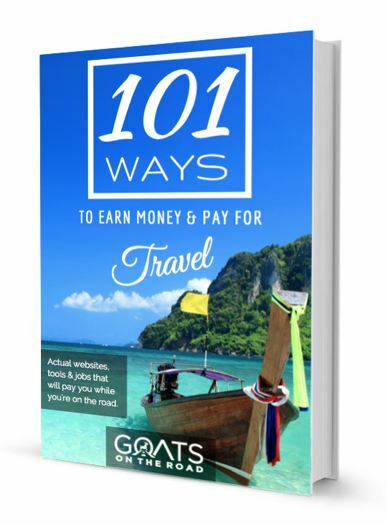 You’ll want to be able to easily grab your pack from under a bus, or from a baggage claim carousel. Make sure your pack has sturdy carry handles. Stowaway harness. As noted above, you’ll want to buy a backpack that has a back panel for zipping away your harness and hip belt. This will keep the most important part of your bag protected on travel days. Weight. A lightweight backpack is best. Have a look at the specs before purchasing one, even if you’ve tried it on and don’t think it’s all that heavy. Try to go for a pack that doesn’t weigh more than 4 pounds. Compression straps. You’ll want to be able to compress your clothing and your gear, both from the inside, and on the outside of the bag. Keeping the weight as close to your back as possible makes it more comfortable, and easier on your back. Different sizes. These days most packs will offer a variety of sizes for each model. So, if you want a 55L backpack, you can choose between a S/M or a M/L. The small, medium and large refers to your height. Ensure that your backpack is in proportion to how tall you are. Your pack shouldn’t be sticking so far above your head that you have a headrest while wearing it, and it shouldn’t be so short that the hip belt is up around your waistline or ribcage. Removable daypack. This is a bonus! There are lots of bags out there these days that have a removable daypack (rucksack). This is great for travel days when you want to have your laptop, camera and valuables with you. In the end, it’s all about comfort. Make sure that the backpack properly fits you and your body. The size of backpack you’ll need for your trip depends on a number of factors. 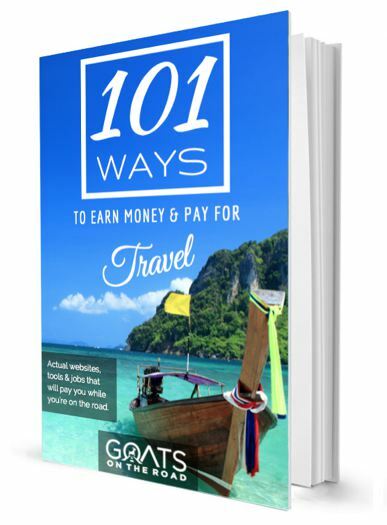 If you’re going to be a full-time traveller, are going on a long trip, or are travelling through numerous regions (and therefore climates), you will probably want to opt for a bigger backpack. I believe that 55L is a good size backpack for a long trip to multiple climates. 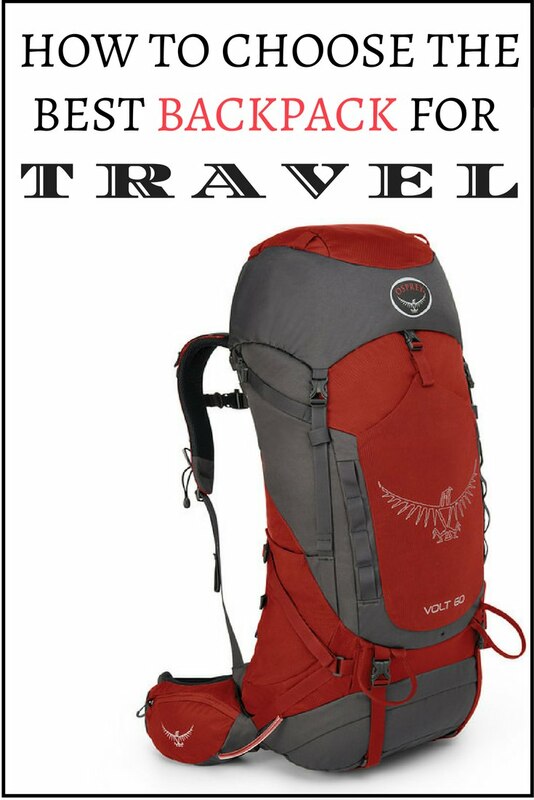 This will allow you to bring enough gear, while ensuring that you don’t overpack. 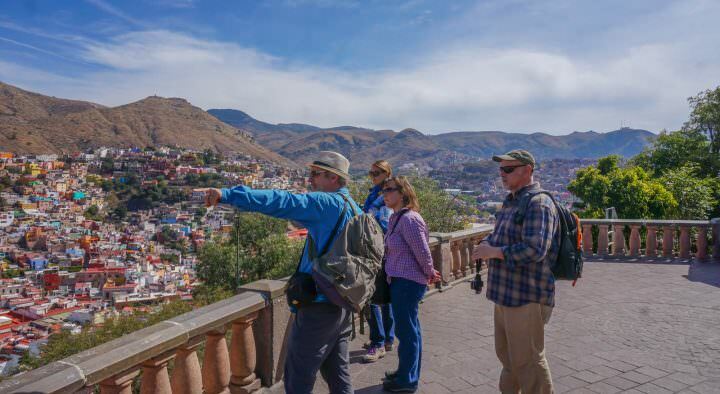 If you’re going on a shorter trip for a couple of months, or only visiting warm climates, you should be able to travel with a 40L backpack, or smaller. 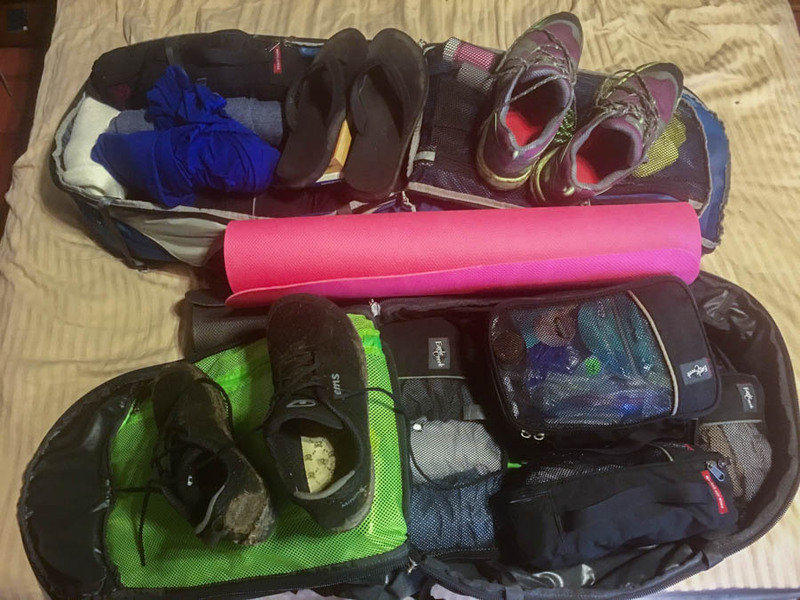 Get creative with your packing! There’s no correct, or incorrect size, it just depends on what feels comfortable to you. This pack was only 32L, but there were lots of things hanging off of it – that’s why it looks so big! There are so many backpack companies out there, with some of the top-rated being Deuter, Osprey, Eagle Creek and The North Face. These brands are highly rated for good reason. Since 2008, we have used three different brands – Deuter, MEC, and Osprey (and Vanguard for our camera gear). MEC is the house brand of Mountain Equipment Co-op, a major camping store in Canada. This is similar to REI in the United States. The Deuter Traveller 70 was Nick’s first backpack and mine was the MEC 60L luggage entry. Those two bags held up to the task of being beaten and battered for 13 months of budget travel in SE Asia, India and Sri Lanka. We returned to Canada with our bags intact and ready for the next trip. Those same backpacks endured a further 16 months of budget travel through Africa, the Middle East, Europe and Asia! These packs were great, but with their thick canvas material and metal bar frames, they were unnecessarily heavy. 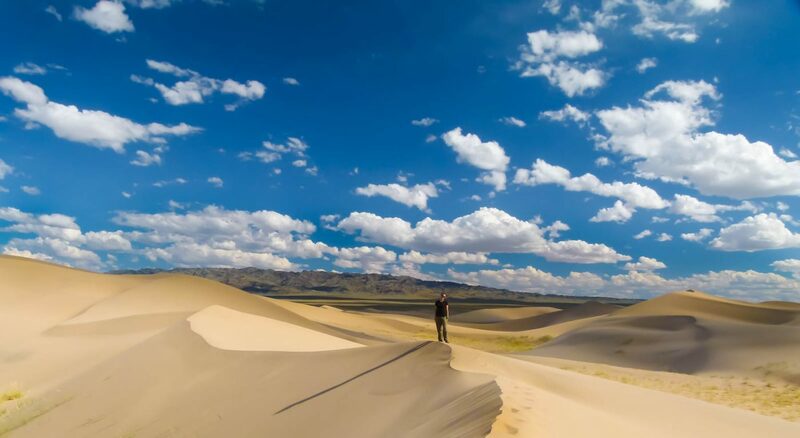 Our next trip brought us through Mongolia, Russia, Central Asia and Iran. 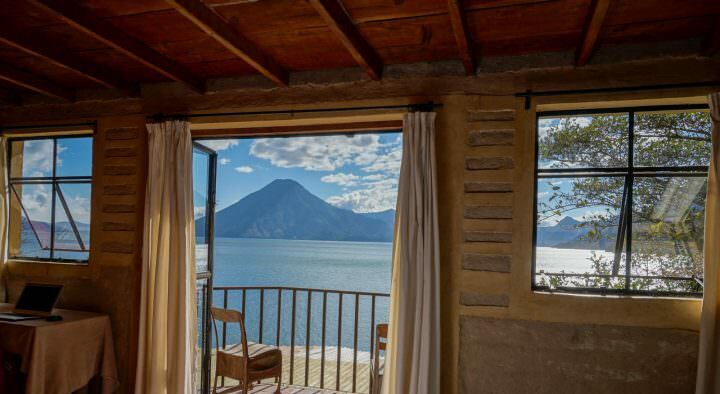 This trip was going to focus on trekking and camping. Because we were going to trek with all of our gear on our backs, we knew we needed to upgrade our backpacks to lightweight. 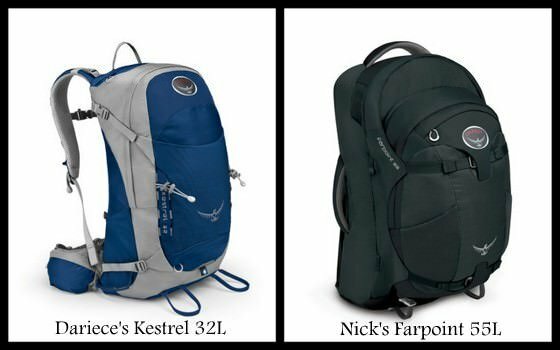 For this journey, I went with the Osprey Kestrel 32 and Nick decided on the Osprey Farpoint 55. We downsized all of our travel gear to fit into a total of 87L vs. the combined 130L that we had with the Deuter and MEC packs. 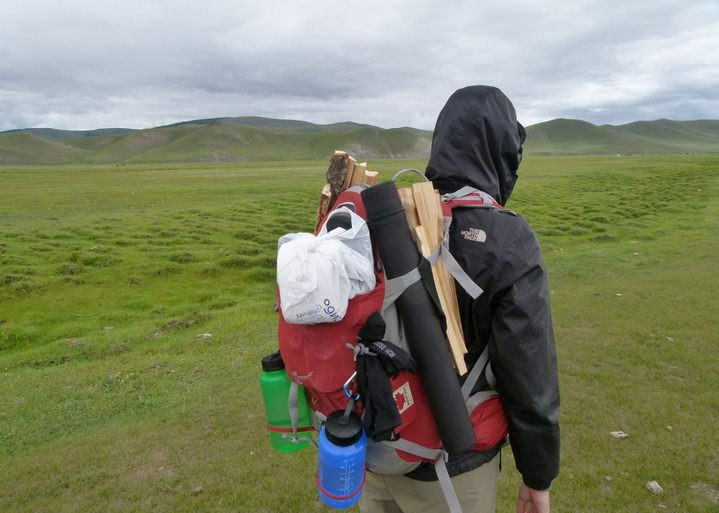 This pack was amazing for trekking – look at all of the straps and hooks! To this day, I still highly recommend the Osprey Kestrel 32. 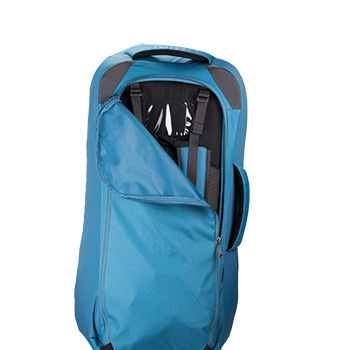 It’s a great pack for anyone going on a shorter trip, a hiking trip, or for someone who is an excellent carry-on packer! Click here to read my full review. As our travels moved away from trekking and more into regular, full-time travelling, I gave up my beloved Kestrel backpack (it was just too small), and I now have an Osprey Farpoint 55 as well. 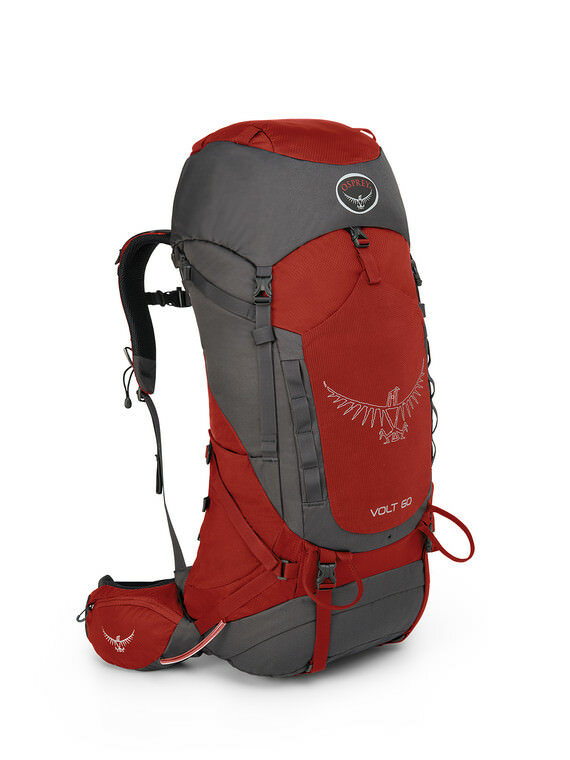 Click here to see Nick’s review of the Osprey Farpoint 55L. Nick has travelled with a Farpoint since 2013 and I recently purchased mine in Prague. These bags are durable, fairly lightweight and tick all of the boxes when it comes to features we’re looking for in a front loading backpack. 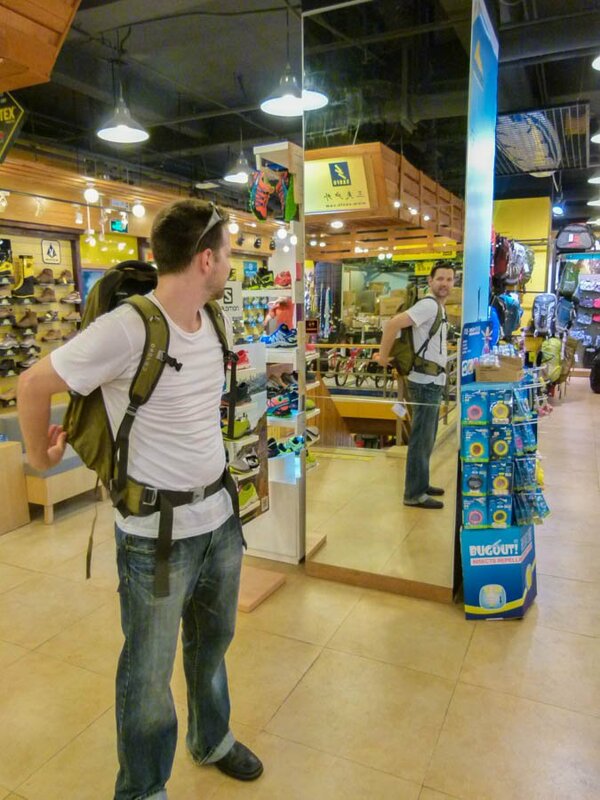 We are old school and prefer to head into the outdoor store and physically try on the backpack that we’re thinking of buying. We’ve done this since 2008. All of the reputable camping and travel shops should have knowledgable staff willing to help you out with choosing a backpack that fits your body. They’ll even fill the bag with the equivalent of about 30 pounds so that you can see what the pack will feel like when it’s full. You’ll also be able to see (and try on) a wide variety of packs, which is always great. After figuring out which backpack fits you the best, you can purchase it in the store, or online, if you want. These days, so many people are online shoppers, which isn’t surprising as you can find awesome discounts and deals when buying products on the web. 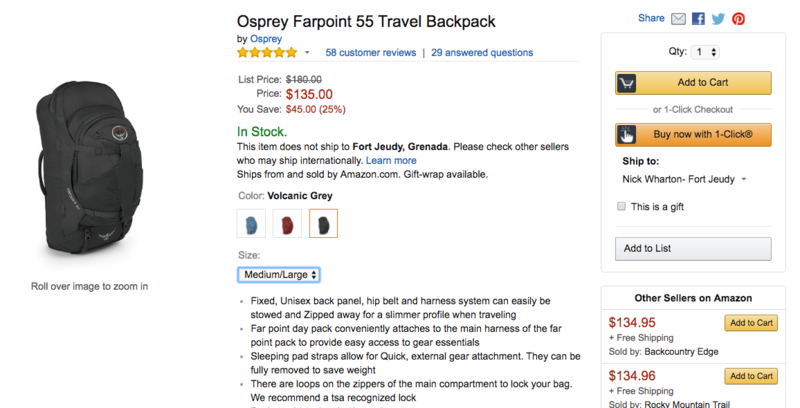 If you purchase the same backpack that we have (Osprey Farpoint 55L) through a store, the Osprey Website, or REI, it will cost you $180.00. If you purchase it with Amazon, it’ll cost you $135! Typically, backpacks and travel gear will be cheaper when bought online through Amazon or something similar. Which brand and style of backpack do you travel with? Tell us below! Great article, I recently discovered this blog, and I am about to buy a new backpack so this was very helpful, as is the rest of the blog! Thanks for the great content! Thanks Logan! I’m glad that you found the post useful 🙂 Happy Backpacking. Thanks for your article. It is very useful for my next trip. Hi Dariece, I’m going on a short (1 month) trip to Italy, Croatia and Slovakia and am wondering what brand of backpack you would recommend for day trips? I would like an anti-theft one as I’ll be carrying camera, iPAD, and other items for the day. Appreciate your thoughts!